www.janetcharltonshollywood.com Want more details? Visit my bio and click on link! » Blog Archive » WHAT’S EATING JOHNNY DEPP? Hey, it’s big news when Johnny Depp updates his hairstyle with a new undercut. 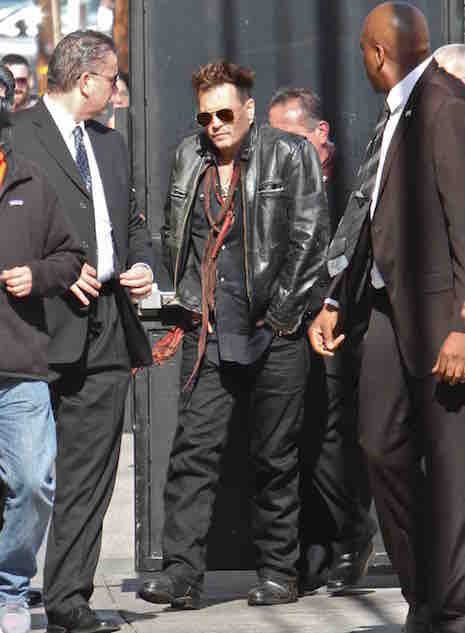 His hair is very cool, but he doesn’t look particularly happy in this photo of him arriving at the Jimmy Kimmel show. He’s busy promoting his new movie Alice Through the Looking Glass in which he plays another crackpot character- the Mad Hatter. We’d like to see him in a film aimed at adults, for a change. Larissa sadly it is NOT. Why is JD starting to resemble Charlie Sheen? He smoked away his good looks–just like Mel Gibson–one cigarette at a time. Booze and goodness-knows-what-else didn’t help. This is one of the fastest downward spirals I have ever seen in my entire life. WTF happened to this guy? He looks positively awful. poor johnny….. he lost his elegance. 21 jump is on some broadcast ch. man, he looks like he is 10 in that show. He looks severely unhealthy and very unhappy. Hope he gets the help he needs. He has been looking repulsive for a long time now.